Discussion in 'TSLA Investor Discussions' started by DaveT, Nov 4, 2013. So since you choose to criticize his effort to help the trapped children can you share with the forum how you helped? Did you contribute any funds to the effort? Are you also going to post about helping with the lead contamination in Flint water supply does that bother you as well? I believe it is not only a worthwhile humanitarian thing to do but also great PR in the state of Michigan with anti tesla government. Dave’s not putting Elon down, he’s saying there are better formats for good news. Twitter can be an offense defense type of platform < which can turn into me vs yo, us v them. A TED talk on SpaceX was great and probably worth a year of good will. Do another about the Boring company, or start a philanthropic organization to solve public problems with engineering, like Flint. Creating positive venues that don’t expose you to twitter trolls and bring you down to their level. I agree with Dave, he needs to change the narrative and mixing up the mediums would be an important start. 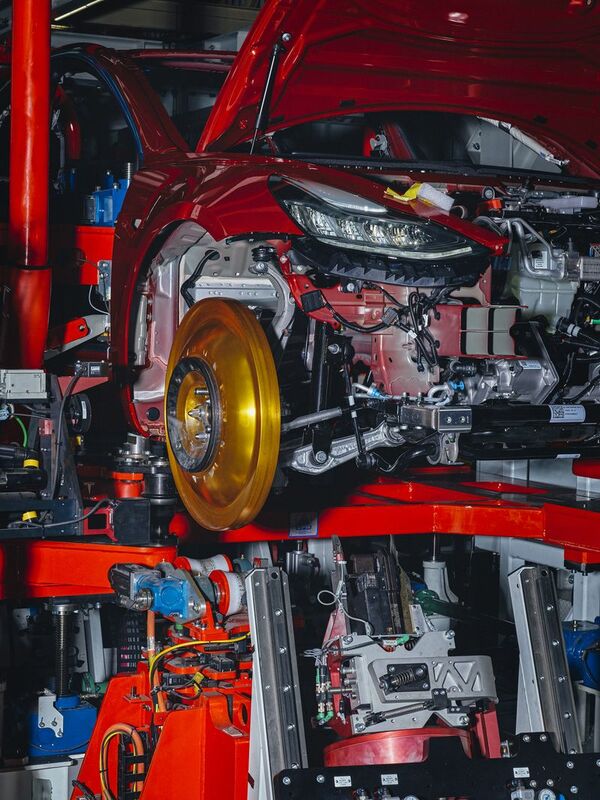 This is the "Golden Wheel", it's purpose is probably why Tesla was able to do away with the Roll & Brake testing?? Field’s team invented dozens of industrial processes. One involved a tool called the golden wheel, an apparatus that automatically breaks in suspensions and aligns cars in one step without humans. This is why I'm more positive about Tesla than last few months. They screwed up really bad. And came out stronger, with better understanding of what is possible, what's worth doing and with experience that no one else in the industry has. Company is a sum of processes, products, customers and people (*simplification). And people that Tesla has today are much more experienced than ones Tesla had 3 years ago. And in some ways more experienced than the rest of the industry, not only on the EV parts. True, but it is still pitiful that any news about Tesla has to be fact checked to verify it's validity. Dave's interview just barely touches the tip of the iceberg. So many people wanting their 15 minutes of fame, knowing full well they are spreading FUD. To lessen the focus on Elon it would be nice if he brought some of his engineers alongside to speak to some points. Share the spotlight and help develop his team's media savvy. JB would be perfect for a Ted Talk on Tesla's vision for batteries. Edit: Elon's latest tweets regarding Flint are similar to his Thailand efforts. I cannot help but think he could go about communicating this in a better manner as this will be construed as an attempt to manufacture positive publicity. Please explain what do you mean by "manufacturing positive publicity"? 10s mln of peole twit or blog about things they do in their personal time with photos etc. He does exactly same thing. I don't see any CEO, TESLA etc. in his twitter title. Musk tweets are his personal thing and are meant to inform all those people who are subscribed to his account. He informs them. The rest of people are free to read other 10mlns of people who twit every day. It is not like there is some law that a CEO of some company has to be loved by everybody. Thailand efforts come out not as his personal initiative and don't consist of "useless submarine" only. The efforts started partially in twitter and he was informing readers on it's progress. If some journalists being journalists didn't succeed to hold the line of quickly enfolding events and were very eager to jump to wrong conclusions it's their problem. The same applied to Flint. Local administration is thankful, they informed about it as well, the efforts are real and are useful. About interviews etc. : he just like the rest of the world who ever did pbulic interviews has huge baggage of misinterpretations and wrong words attributions. In this world the only right way to do interviews is to avoid them. Agree with all you say except the last sentence. I would like to see more interviews from him, both in video and print. He is the best person to tackle all the misinformation. Musk did an interview some days ago with Tom Randal. They are incurable. Yes, obviously good interviews where interviewer just ask questions, doesn't interrupt and generally tries to be invisible are the best source of information. The question is where to find a normal journo with no inflated ego. The only more or less normal tv reporting about Tesla I've seen were small pieces by CBS with Gayle King. Can you find examples of similar quality? I understand and agree with what you are stating about the media distorting Elon’s words. I wasn’t referring to articles but to actual interviews. Did you have the same feeling about the interview with Tom Randall ? Musk and engineers spent a day with these journalists and this is the result. Instead of normal interview shots and real quotes they spit again BS interpretations and their personal opinions. Again idiotic advises of what Musk should change in his behavior. That Musk changes and adapt design of everything non stop until mass production stabilized is no secret. It is not 2012 anymore. And btw it is called rapid prototyping. Another journo in this clip is simply clinical. Again rehashing the only real documented case of an injury. Result of the prank btw. Again stating not proved claims as fact. Again not finding this person, not finding the idiot who run him over, no real visit in Fremont factory and no talking to real workers. Typical "Diagnose by photos" (facepalm). And interview was quite weak. They were again asking and talking about garbage. Who cares about how many shorts Musk changes? I hear you, and agree it’s a pretty depressing situation. A lot of people, companies and institutions are obviously threatened by what Elon Musk is doing with Tesla. Still think Elon is the best person to fight back against the negativity. Up to him how he does it. Hoping the continued success of the company will quiet a lot of the negativity we get in the business media. More interviews with Gayle King are in order, I think. What is wrong with Elon, being Elon? Isn't he allowed to have a life for himself? Why is everyone trying to shove him into what they think he should be, a CO, CEO, Father, Philosopher or whatever society needs. We all don't have to like each other but we need to understand (to a degree), each others space. I personally can separate Elon the individual from Elon of Tesla fame and so should others. Give the man some room, those who want to tell him how to act, would certainly would expect this from others. i didn’t see anything after the interview. what happened? i must not have been able to view the full uncut video. they didn't release video with uncut interview. They didn't use even pieces with interview. Instead they film themselves talking about. You can just take few minutes and watch yourself. In interview story they didn't follow simplest form of interview's transcript, they used cut&place interleaving direct and indirect quoting making a web of a story. While it looks cool it is always very subjective and it's always with serious mistakes. And I am sure with plenty of moments of changed or even injected words. In other words it is fake. Frankly I don't understand him. His team had to choose one with full control over interview form and it's content. It's a requirement to have a final text before with interviewer approval. We are ultra sensitive when it comes to anything Tesla/Elon. It’s a fact. Many published articles/reviews isn’t as bad as we claim here. I’m sure the flip side the bears/haters would want the article/review worse. The model 3 review by Doug Demuro is case in point. Most here would say he was critical and anything less than 100 “Doug” points was unacceptable. Even though the review was extremely positive. Doug DrMuro made fun with both the Model 3 and Model X, but in the end he did think both were pretty good cars. He admitted the Model X was the future. Elon is one of the top innovative industrialists in history and possibly the top living one. He really is changing a lot of things for the better. However, he is human and has human failings. Objectively Tesla and SpaceX are difficult places to work. Musk pushes himself to levels few human beings can sustain and he expects everyone working for him to keep up with him. Upthread someone wondered if Elon is on the Autism spectrum. I'm not, but I had to learn social skills as an adult (weird family and poor socialization) and I've known a number of people who were once diagnosed with Asperger's Syndrome (now just called mild autism). I'm not sure if Elon is on the spectrum or not. To apply another model, I think Elon would come up INTJ on the Myers Briggs Type Indicator and I have known some people who had very few Feeling skills diagnosed as having Asperger's, though I don't think they were, it's just that their "go to" skills for decision making were always Thinking and almost never Feeling. Everyone has emotions, whether Thinking or Feeling, but people who overly rely on Thinking can come across as harsh in personal things. Elon correctly thinks that whoever makes the best product will win in the end. However, the product is not just the car. The product also is the message and narrative surrounding the car and company. In other words, people’s beliefs are becoming increasingly influenced by those who are aggressively trying to influence them. People have always been influenced by others and popular opinion. For example, think of cliques and peer pressure in school. Car makers have known that they live and die off of the perception that people have of their brand. That’s why they spend millions on advertisements to promote and establish their brand in the minds of people. Lexus tries to associate luxury and prestige with their brand. And they’re successful, at least to some extent. But now there are a million ways to influence people, and not just through TV commercials. Elon appears to believe that if Tesla makes great cars, then they’ll be fine. However, that’s assuming there’s no massive onslaught of negative propaganda that is establishing Tesla as an undesirable brand in people’s minds. If there is an onslaught of aggressive negative propaganda against your product, then the company ought to have an overwhelming creative, smart and compelling strategy to overcome that onslaught. If you’re being attacked relentlessly and you lack a plan, you just might be toast. While Elon and Tesla, I am sure are trying to devise a plan… at least so far their efforts haven’t been that effective. The narrative around Tesla in the media is largely being controlled by those against the company. Elon’s vitriol for marketing also I don’t think is helping. Elon, always looking at things from first principles, thinks the best product will win at the end. What’s missing though is the crucial component of how the message and narrative around the product forms a crucial part of the product that can’t be divorced from the car. Over the past several months, I’ve been posting about how Tesla needs to take control over the narrative around their products and company. What I mean by “taking control over the narrative” is not just PR. It’s far beyond what PR typically entails. “Taking control over the narrative” means a comprehensive strategy to defend and overcome the onslaught of negative attacks, while establishing a compelling and overwhelming positive message surround their company and products. This is simply not the job of a PR team that might be experienced in traditional PR. We’re talking next-level stuff here. This requires the best of the best. Meaning, I think it requires the best in the world. Tesla ought to find that person, empower him/her with a great team, and give him/her the power to take control over the narrative on a level that’s never been done before in Tesla’s history or in the history of any other company. I agree with your thesis of “taking control over the narrative" etc. I get that you have your opinions about many things, many here about Elon. But it's not a good idea to mix personal opions with facts - IMO you mashed these two different things together when you talked about what Elon thinks. In fact (ironically as I'm talking about opinions), my opions about what Elon thinks about the things you talked here are drastically different from yours - but still, just opinions. Many of us had been rattled by the Elon pedo tweet drama. Some still are. Let's take it down a notch or two. What's absolutely puzzling is that maybe a mere year ago, Elon was still the darling of the public opinion. I am wondering if we are seeing the icarus effect in it's most literal form when he sent his Roadster just because he could.